Ernest attested on 4th November 1915. He was 23 years and 11 months old; a Labourer by trade, and living at Great Cliffe, Crigglestone, Wakefield at the time. He joined the R.A.M.C. at Aldershot two days later, and was posted to "D" Coy on the 12th. On the 11th December, after passing a course of instruction in first aid, he was posted to "N" Coy. Ernest embarked at Southampton on 19th June 1916, then disembarking the next day at Rouen, entered the war in France on 20th June 1916. 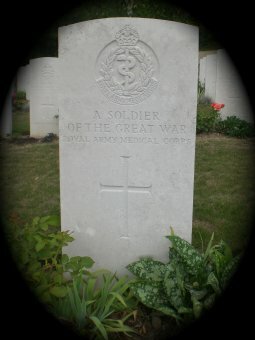 He was posted to serve with the 12th Field Ambulance, in the field, on the 28th June, and remained with them until he was killed. Ernest was the son of Arthur and Harriet Clarkson of Great Cliffe, Crigglestone, Wakefield.